Emily Readett Bayley’s first visit to Hutan Harapan RSPB Forest of Hope in Sumatra was to research the craft heritage of the indigenous Batin Sembilan community and quantify what sustainable natural materials can be cultivated or sourced from within the ecosystem restoration area that makes up the forest concession. 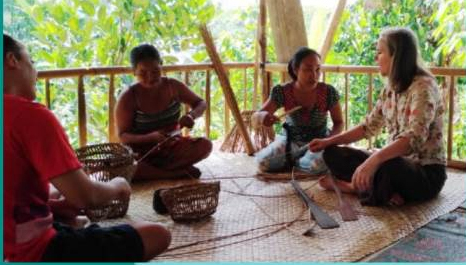 The aim is to provide livelihood opportunities for these semi nomadic people who like the tigers they share the forest with are finding it harder and harder to subsist as hunters or gatherers. She has been asked by the RSPB and partners to develop a variety of handcrafted products including baskets, brushes, plant pots and bird boxes suitable for sale in European Garden Centres.